For this week’s vase, I’ve used only wildflowers picked from our fields and woods that are native to the northeastern U.S.
Asters have come abundantly into bloom (we have more than half a dozen different species), of which I’ve chosen three: white wood (Eurybia divaricata), calico (Symphyotrichum lateriflorum) and sky blue (Symphyotrichum oolentangiense). Orange and yellow jewelweed (Impatiens capensis and I. pallida) provide dots of warm color along with sprigs of goldenrod (Solidago sp.) and the last of the bright yellow daisies of woodland sunflower (Helianthus divaricata), which are going to seed, to the delight of the goldfinches and chickadees. A few stems of white snakeroot (Eupatorium rugosum) and purple spikes of pickerelweed (Pontederia cordata) contrast nicely with the yellow and orange. Swords of evergreen Christmas fern (Polystichum acrostichoides) provide a nice foliage accent. The clear glass vase once belonged to my grandmother. Wander over to see what gardeners all over the world are arranging this week. Feel free to join in, sharing your own weekly vase with a link to Cathy’s blog. 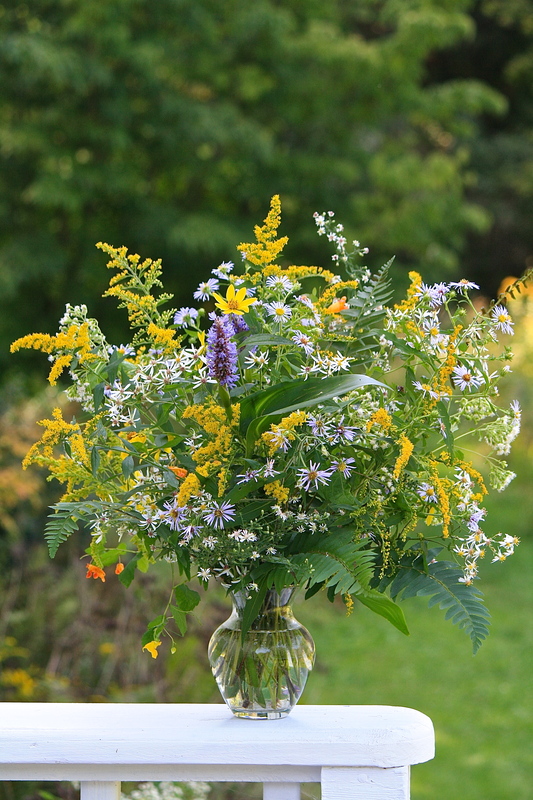 This entry was posted in Country Gardening, My Photos and tagged Christmas fern, flower arrangement, gardens, goldenrod, In a Vase on Monday, jewelweed, meme, native asters, photography, pickerweed, Weekly Vase Challenge, wildflowers, woodland sunflower. Bookmark the permalink. Beautiful, Eliza. I love the wildflowers this time of year. They also give me fair warning that summer is about over, at which time I dig in my heels…but it doesn’t do any good. You know, resisting what is, one never wins. Haha. At least fall is beautiful…a nice buffer between summer and winter. Haha, yeah. I always end up liking each winter, but I’m always reluctant to accept its coming. Cutting and carrying wood gets harder and harder, but so far I’ve made it through each one. No reason to fear it won’t be that way this time. One winter at a time! I love E. Tolle! That is one thing nice about natives. They all go together so good. I love they way you have them arranged. Beautiful. Thanks, Heather. The hummers and insects are very happy. Even while I was arranging this, the bees were visiting! The vase is barely able to contain the bursting bouquet! It gives the feeling of abundance. Nice. Eliza this vase is stunning…it is huge with those abundant native wildflowers beautifully arranged. I have always found wildflowers to be stunning. They simply remind me we don’t have to try to hard- things are naturally beautiful. That is a beautifully crafted display. During our walks on the trails in our part of town, there are lots of wildflowers everywhere. The ample rains and generally cool summer have allowed strong growth of many species. The jewelweed are really tall this year. Thanks, Jim. 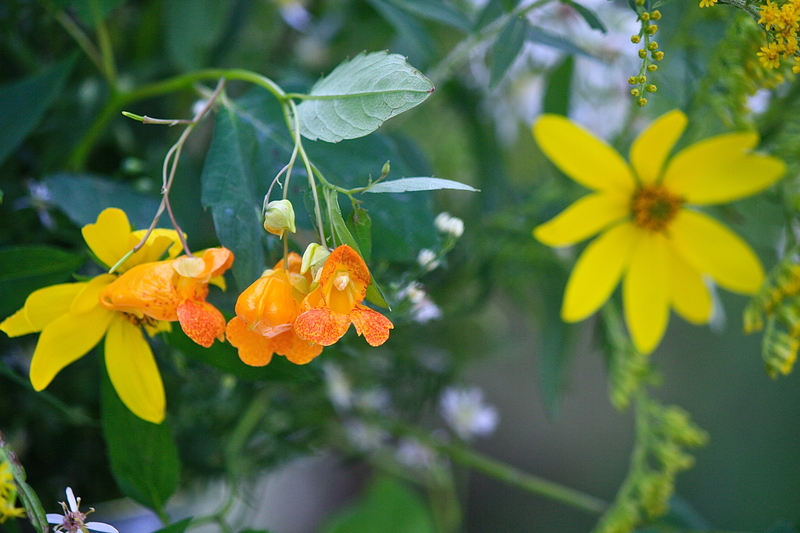 Jewelweed can get quite tall, some as high as ten feet in good conditions. It is a favorite of hummingbirds and bumblebees! Thank you, my dear! 🙂 Fall is all around the edges of our world! Another stunning display, Eliza, I don’t know how you come up with so many gorgeous arrangements every week, but I’m so happy to see them. Do you still have any flowers or plants growing during the winter months, or is everything usually covered in snow? Thank you, Joanne. Not much happens from the end of Oct. until early April – everything goes dormant. Snow comes in Dec. and stays until the end of March. Winters are way too long in New England! How wonderful to have such a beautiful collection of flowers growing wild around you! The arrangement made me smile as soon as I saw it. I have a few asters but the stems are too short and the flowers too few to do much with. Thank you Kris! I am blessed with a ton of wildflowers, a lot of it is goldenrod. Hi Eliza, such a beautiful vase again this week! I love wild flowers and it must be wonderful seeing all these in flower nearby so late in the summer. Thank you, Cathy. I esp. love the asters dotting the fields and woodland edges. Little cheerful stars! My Goldenrod is finally blooming, but I had to plant it, and I would not be able to find neat wildflowers at this time of year like you have filling your vase so wonderfully. I like the contrast of the purple Pickerelweed, and how great to have an heirloom vase from your grandmother. I love this late summer exuberance Eliza! 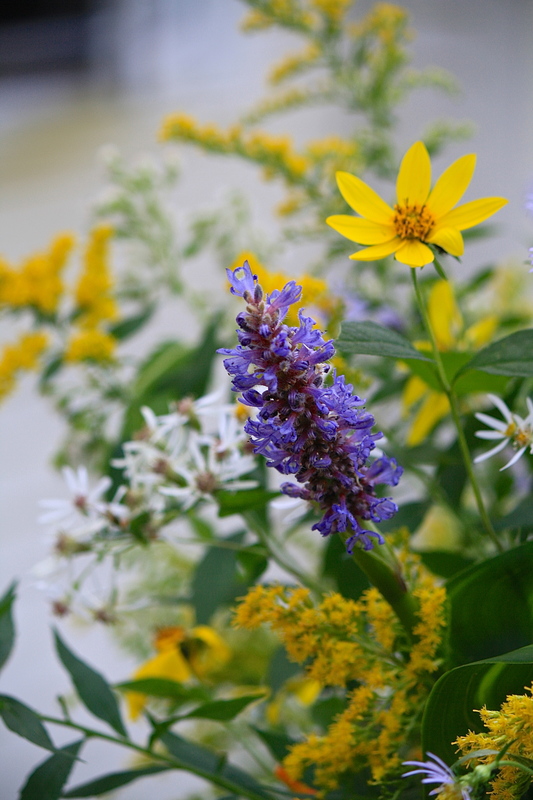 The smell of our hives has changed with the addition of golden rod and asters. The bees are so busy bringing the last pollen home! Thank you, Val! You keep bees? Neat! Do you have Jap. knotweed around? I can’t believe how the honeybees are drawn to it (it does smell sweet!) and not the native bees, just a few fly pollinators. It is interesting! Yes, we have 2 hives Eliza! This is year 2 and we are learning so much! I haven’t heard of jap knotweed. Will check it out! Our guys are high fliers – they zoom up and away across the treetops. One positive (other than the bees loving it) is that is found to be effective in treating chronic Lyme disease. Beautiful colors, wildflowers are so unique! Thank you, Maria. Summer’s last hurrah! LOVE this wild and beautiful arrangement Eliza! 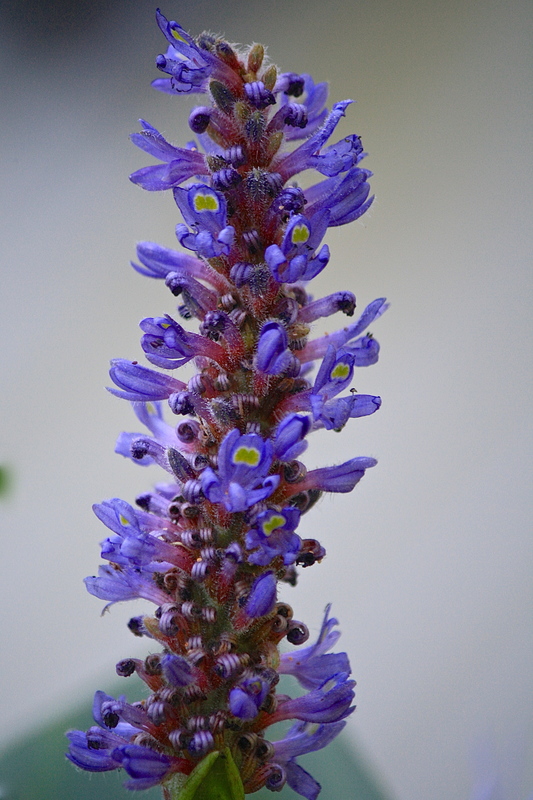 I was just admiring Pickerelweed at the lake yesterday! Thanks, Sharon. I’ve always favored the wild look, as it looks so much more natural. Are my comments still getting stuck in your spam folder? Oh no! I’ll go check right now! Yep, I just unspammed three of your comments. Thank you for the alert! Phew! Glad you caught them! Akismet erroneously has been putting my comments into spam folders on random sites – it started when they changed the reader, so who knows why? You were on your trip, so I had to wait to tell you once you contacted me. It’s been a pain! 😉 Glad I can get back to giving you kudos! Your trip looked fabulous! Beautiful photos grace your page, Eliza! 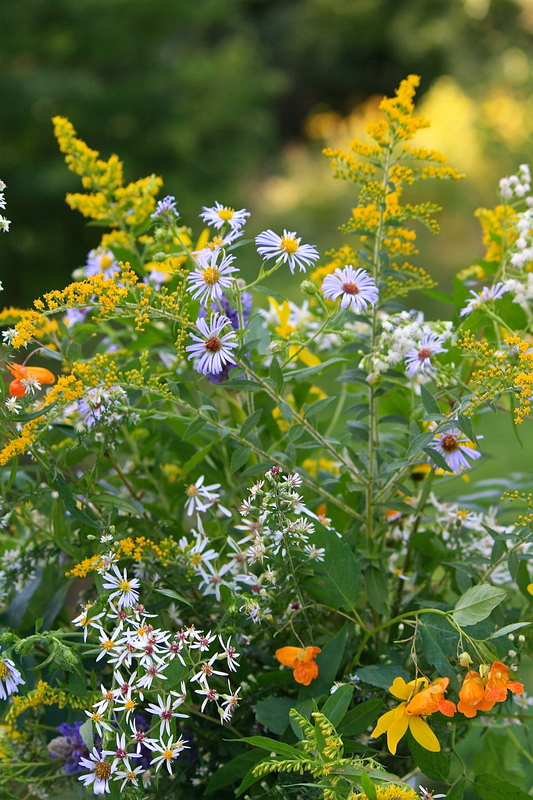 I love the variety of colors…there is one spot in my yard that I am attempting to grow only Wildflowers…we will see what happens next Spring. I like the writings of E. Tolle also…and Thich Nhat Hahn…they are saving me these days….Thank you for being so kind and faithful to reading my blog…I will try to do the same for you! Blessings! Daily spiritual reading is a must for me, even it is just a quick glance at the daily guide in Science of Mind magazine. It sets a good tone for the day! Your beautiful arrangement is the culmination of my day of gardens. Will be blogging about a visit to Ridgely Gardens in CliftonForge, VA. ‘Tis an amazing place even at this time of year. Sounds wonderful, can’t wait to read about it- I love visiting public gardens. When I travel, it is the first thing I look for! Yes, she comes over and we cut flowers and make arrangements, which she proudly carries home to her mother. Beyond sweet! Thank you, Eliza. You have quite a little protege! How sweet for both of you. The hummers have been all around the last 2 or 3 days. I get a real sense they appreciate the flowers we are keeping available for them- and the sprinkling! I’ve been told by a naturalist that our males have already departed, (you might be seeing my little buddy I’ve watched all summer! ), the females go next, followed by the juveniles last. Guess they need to boost their reserves, but the flight pattern must be in the DNA. Migration is so fascinating! That is surprising, Eliza, as one might expect them to travel in family groups to be less vulnerable. Migration is fascinating! That would help explain why we are seeing more individual hummingbirds than usual. They must be stopping here for refreshment along their migratory path…. So it would seem. Imagine those little guys flying thousands of miles. It boggles the mind! yes, It does. But they are so strong for their size! They set up quite a breeze when they fly close! Birds and butterflies always amaze me with their strength, intelligence, and resourcefulness. Gorgeous bouquet, as always – such a beautiful combination! Mother Nature has really outdone herself with these – and you’ve taken full advantage! She does have a flower costume! I had forgotten about it until you just mentioned it. Perhaps I will break it out soon and celebrate the return of flowers to the southern hemisphere (and bemoan our soon-to-be-gone ones here!). such a pretty vase, Eliza! I love wildflowers, but am not sure that our native wildflowers are quite as lovely as the ones that you found, but I am inspired to start looking! From what I’ve gathered, where we have lots of late summer wildflowers, I think yours are abundant in the hedgerows in spring! WOW! Absolutely beautiful arrangement and nice informative post! I don’t know how I missed this post earlier this week Eliza. This is without doubt THE BEST bunch of flowers I’ve seen in a long time. Simply beautiful. An inspiring wild and beautiful bouquet! Thank you very much, Anca! Thank you, Sreejith! So nice to hear from you, have a great weekend!